The cricopharyngeus muscle, also known as the upper esophageal sphincter (UES), was first described by Valsalva in 1717. Over time, an association between dysfunction of the cricopharyngeus and pharyngeal diverticula was identified. In 1946, Lahey proposed dilatation of the cricopharyngeus for the treatment of pharyngeal diverticula, which greatly added to physicians' understanding of upper esophageal dysphagia disorders. In 1950, Asherson proposed the term cricopharyngeal achalasia to denote a persistent spasm of the UES that causes symptoms of dysphagia. Several subsequent authors have proposed cricopharyngeal myotomy for the management of upper esophageal and pharyngeal dysphagia in the setting of polio, degenerative neurologic disorders, and strokes and after head and neck surgery. Anatomic location of the cricopharyngeus muscle. Cricopharyngeal myotomy, or surgical sectioning of the cricopharyngeus muscle, has been advocated for the treatment of cricopharyngeal spasm that causes cervical dysphagia. The exact incidence of cervical dysphagia caused by cricopharyngeal dysfunction is unknown. The lack of epidemiologic data results from the significant controversy regarding the diagnostic criteria required for proper use of the term cricopharyngeal dysfunction (ie, achalasia); some authors base the diagnosis solely on symptoms, while others hinge the diagnosis on highly specialized radiologic and invasive probe studies. Although the exact incidence of cricopharyngeal dysfunction is unknown, the literature reports cricopharyngeal achalasia as the primary cause of or as a contributor to dysphagia in 5-25% of patients being evaluated for clinical symptoms of dysphagia. Cricopharyngeal achalasia may be primary or secondary. Primary cricopharyngeal achalasia implies that the abnormality that leads to the persistent spasm or failure of relaxation of the cricopharyngeus muscle is confined to the muscle, with no underlying neurologic or systemic cause. This primary group can be further subdivided into primary cricopharyngeal achalasia with no underlying cause (ie, idiopathic) or cricopharyngeal achalasia caused by intrinsic disorders of the cricopharyngeus muscle (eg, polymyositis, muscular dystrophy, hypothyroidism, inclusion body myositis). In many instances, the cricopharyngeal spasm may be secondary to neurologic disorders such as polio, oculopharyngeal dysphagia, stroke, and amyotrophic lateral sclerosis (ALS). Peripheral neurologic disorders,such as diabetic neuropathy, myasthenia gravis, and peripheral neuropathies, can also cause cricopharyngeal dysfunction. The pathophysiology of cervical dysphagia, as it relates to cricopharyngeal dysfunction, remains unclear. Three main theories have been proposed to explain the relationship between cricopharyngeal dysfunction and dysphagia. The most widely held theory reasons that the cricopharyngeus, which is normally in a state of tonic contraction, fails to relax to allow the passage of the food bolus into the cervical esophagus. This theory has been supported by radiologic and manometric data. Other investigators have identified patients with hypertensive cricopharyngeus muscles, which are abnormally hypertonic during the swallow. Finally, others have identified a relative lack of coordination between the pharyngeal propulsion and the cricopharyngeal relaxation. These debates are likely to continue given that the full physiologic measurement of the cricopharyngeus during swallowing is difficult and invasive. Furthermore, the presence of the manometric catheter may actually stimulate cricopharyngeal hypertonicity because the catheter irritates the esophageal lumen. Finally, recent work has elucidated a potential role of gastroesophageal reflux disease (GERD) as a cause for cricopharyngeal spasm. The clinical presentation of patients with cricopharyngeal achalasia may be quite variable. Most patients primarily experience food sticking or catching in the lower third of the neck. These patients often point to the cricoid region in their description of the dysphagia. Patients may also experience accompanying symptoms of heartburn, choking, and pain with swallowing. Less common symptoms include dysphonia, a globus sensation, and pressure in the neck during deglutition. Symptoms have often been present for months to years. In cases related to neurologic causes, the diagnosis of cricopharyngeal achalasia may postdate the neurologic event or diagnosis by several months or years. A history of pneumonia or aspiration pneumonia should be elicited. The indications for cricopharyngeal myotomy in the treatment of cervical dysphagia are usually based on a combination of patient symptoms, findings from radiologic studies, and, less frequently, manometric information. Before surgical intervention, if possible, aggressively manage underlying etiologies such as neurologic disorders and gastroesophageal reflux disease (GERD). Myotomy may be considered if conservative measures fail and radiologic evidence exists on the video fluoroscopic swallowing study (VFSS) of cricopharyngeal dysfunction that leads to a hesitation of bolus passage. Manometry may also lend some information, and those patients with clear-cut cricopharyngeal spasm with manometric evidence of hypertonic contraction of the cricopharyngeus tend to have better outcomes. Cricopharyngeal myotomy may also be considered in the absence of clear-cut radiologic data when patients present with significant aspiration or weight loss caused by clinically evident cervical dysphagia, especially when other methods of treatment have failed. The cricopharyngeus muscle is a true sphincter composed of striated muscle. Arising from the lateral borders of the cricoid cartilage, the muscle fibers form a sling around the wall of the superior aspect of the cervical esophagus. 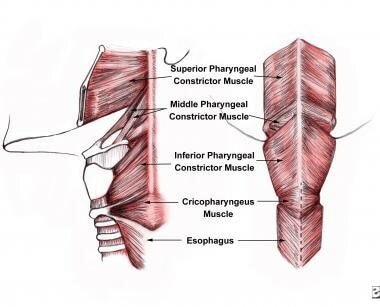 The cricopharyngeus muscle is bordered superiorly by the inferior constrictor muscle and merges inferiorly with the muscular layers of the cervical esophagus. The muscle is innervated primarily by the vagus nerve, both by branches from the pharyngeal plexus and by neuronal branches from the recurrent laryngeal nerve. Therefore, the recurrent laryngeal nerves lie in close proximity within the surgical. The main trunk of the recurrent laryngeal nerve lies in a triangle bound laterally by the common carotid artery, the internal jugular vein, and the vagus nerve and medially by the trachea and esophagus. 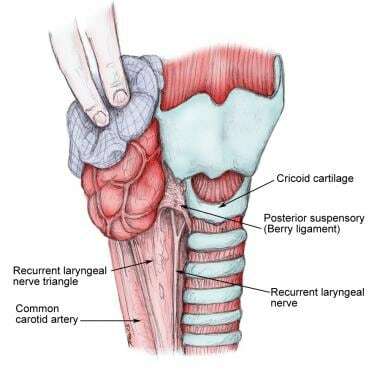 The recurrent nerve passes under the posterior suspensory ligament of Berry (located on either side of the trachea, extending from the cricoid cartilage and the first 2 tracheal rings to the posteromedial aspect of the thyroid gland), before entering the larynx (see the image below). Relation of the recurrent laryngeal nerve to the cricoid cartilage. For more information about the relevant anatomy, see Vagus Nerve Anatomy and Esophagus Anatomy. Cricopharyngeal myotomy is contraindicated when the patient has a known tumor that involves the cervical esophagus or an otherwise correctable mucosal disease that involves the cervical esophagus or hypopharynx. Cricopharyngeal myotomy is also relatively contraindicated in patients who have undergone radiation therapy for head and neck cancer because the cricopharyngeus may be fibrotic and less apt to release when sectioned. Other authors consider cricopharyngeal myotomy to be relatively contraindicated in patients with progressive neurologic disorders such as bulbar palsy. Traditionally, cricopharyngeal myotomy has been thought to afford limited success in the setting of oculopharyngeal muscular dystrophy. However, recent data suggest that it can be effective for several years after surgery with acceptable rates of recurrent dysphagia at 3 years. Finally, cricopharyngeal myotomy may also be relatively contraindicated in the setting of significant gastroesophageal reflux disease (GERD). Although this is controversial, massive reflux may predispose the patient to significant laryngopharyngitis and subsequent dysphonia. Tieu BH, Hunter JG. Management of cricopharyngeal dysphagia with and without Zenker's diverticulum. Thorac Surg Clin. 2011 Nov. 21(4):511-7. [Medline]. Clary MS, Daniero JJ, Keith SW, Boon MS, Spiegel JR. Efficacy of large-diameter dilatation in cricopharyngeal dysfunction. Laryngoscope. 2011 Dec. 121(12):2521-5. [Medline]. Coiffier L, Perie S, Laforet P, Eymard B, St Guily JL. Long-term results of cricopharyngeal myotomy in oculopharyngeal muscular dystrophy. Otolaryngol Head Neck Surg. 2006 Aug. 135(2):218-22. [Medline]. Ho AS, Morzaria S, Damrose EJ. Carbon dioxide laser-assisted endoscopic cricopharyngeal myotomy with primary mucosal closure. Ann Otol Rhinol Laryngol. 2011 Jan. 120(1):33-9. [Medline]. Huntley C, Boon M, Spiegel J. Open vs. endoscopic cricopharyngeal myotomy; Is there a difference?. Am J Otolaryngol. 2017 Jul - Aug. 38 (4):405-407. [Medline]. Brigand C, Ferraro P, Martin J, Duranceau A. Risk factors in patients undergoing cricopharyngeal myotomy. Br J Surg. 2007 Aug. 94(8):978-83. [Medline]. Oh TH, Brumfield KA, Hoskin TL, Kasperbauer JL, Basford JR. Dysphagia in inclusion body myositis: clinical features, management, and clinical outcome. Am J Phys Med Rehabil. 2008 Nov. 87(11):883-9. [Medline]. Pitman M, Weissbrod P. Endoscopic CO2 laser cricopharyngeal myotomy. Laryngoscope. 2009 Jan. 119(1):45-53. [Medline]. Fujimoto Y, Hasegawa Y, Yamada H, Ando A, Nakashima T. Swallowing function following extensive resection of oral or oropharyngeal cancer with laryngeal suspension and cricopharyngeal myotomy. Laryngoscope. 2007 Aug. 117(8):1343-8. [Medline]. Baredes S, Shah CS, Kaufman R. The frequency of cricopharyngeal dysfunction on videofluoroscopic swallowing studies in patients with dysphagia. Am J Otolaryngol. 1997 May-Jun. 18(3):185-9. [Medline]. Blitzer A, Brin MF. Use of botulinum toxin for diagnosis and management of cricopharyngeal achalasia. Otolaryngol Head Neck Surg. 1997 Mar. 116(3):328-30. [Medline]. Bonavina L, Khan NA, DeMeester TR. Pharyngoesophageal dysfunctions. The role of cricopharyngeal myotomy. Arch Surg. 1985 May. 120(5):541-9. [Medline]. Dauer E, Salassa J, Iuga L, Kasperbauer J. Endoscopic laser vs open approach for cricopharyngeal myotomy. Otolaryngol Head Neck Surg. 2006 May. 134(5):830-5. [Medline]. Ellis FH Jr, Gibb SP, Williamson WA. Current status of cricopharyngeal myotomy for cervical esophageal dysphagia. Eur J Cardiothorac Surg. 1996. 10(12):1033-8; discussion 1038-9. [Medline]. Halvorson DJ, Kuhn FA. Transmucosal cricopharyngeal myotomy with the potassium-titanyl-phosphate laser in the treatment of cricopharyngeal dysmotility. Ann Otol Rhinol Laryngol. 1994 Mar. 103(3):173-7. [Medline]. Hill M, Hughes T, Milford C. Treatment for swallowing difficulties (dysphagia) in chronic muscle disease. Cochrane Database of Systematic Reviews. 2004. (2):CD004303. Kelly JH. Management of upper esophageal sphincter disorders: indications and complications of myotomy. Am J Med. 2000 Mar 6. 108 Suppl 4a:43S-46S. [Medline]. Lacau St Guily J, Zhang KX, Perie S, Copin H, Butler-Browne GS, Barbet JP. Improvement of dysphagia following cricopharyngeal myotomy in a group of elderly patients. Histochemical and biochemical assessment of the cricopharyngeal muscle. Ann Otol Rhinol Laryngol. 1995 Aug. 104(8):603-9. [Medline]. Lawson G, Remacle M, Jamart J, Keghian J. Endoscopic CO2 laser-assisted surgery for cricopharyngeal dysfunction. Eur Arch Otorhinolaryngol. 2003 Oct. 260(9):475-80. [Medline]. Lindgren S, Ekberg O. Cricopharyngeal myotomy in the treatment of dysphagia. Clin Otolaryngol Allied Sci. 1990 Jun. 15(3):221-7. [Medline]. Migliore M, Payne HR, Jeyasingham K. Pharyngo-oesophageal dysphagia: surgery based on clinical and manometric data. Eur J Cardiothorac Surg. 1996. 10(5):365-71. [Medline]. Moerman MB. Cricopharyngeal Botox injection: indications and technique. Curr Opin Otolaryngol Head Neck Surg. 2006 Dec. 14(6):431-6. [Medline]. Muñoz AA, Shapiro J, Cuddy LD, Misono S, Bhattacharyya N. Videofluoroscopic findings in dysphagic patients with cricopharyngeal dysfunction: before and after open cricopharyngeal myotomy. Ann Otol Rhinol Laryngol. 2007 Jan. 116(1):49-56. [Medline]. Oh TH, Brumfield KA, Hoskin TL, Stolp KA, Murray JA, Bassford JR. Dysphagia in inflammatory myopathy: clinical characteristics, treatment strategies, and outcome in 62 patients. Mayo Clin Proc. 2007 Apr. 82(4):441-7. [Medline]. Parameswaran MS, Soliman AM. Endoscopic botulinum toxin injection for cricopharyngeal dysphagia. Ann Otol Rhinol Laryngol. 2002 Oct. 111(10):871-4. [Medline]. St Guily JL, Perie S, Willig TN, Chaussade S, Eymard B, Angelard B. Swallowing disorders in muscular diseases: functional assessment and indications of cricopharyngeal myotomy. Ear Nose Throat J. 1994 Jan. 73(1):34-40. [Medline]. Takes RP, van den Hoogen FJ, Marres HA. Endoscopic myotomy of the cricopharyngeal muscle with CO2 laser surgery. Head Neck. 2005 Aug. 27(8):703-9. [Medline]. Wilson JA, Pryde A, Allan PL, Maran AG. Cricopharyngeal dysfunction. Otolaryngol Head Neck Surg. 1992 Feb. 106(2):163-8. [Medline]. Zaninotto G, Marchese Ragona R, Briani C, et al. The role of botulinum toxin injection and upper esophageal sphincter myotomy in treating oropharyngeal dysphagia. J Gastrointest Surg. 2004 Dec. 8(8):997-1006. [Medline]. Typical appearance on swallowing videofluoroscopy of cricopharyngeal achalasia. Note the prominent posterior indentation in the barium column at the level of the larynx.